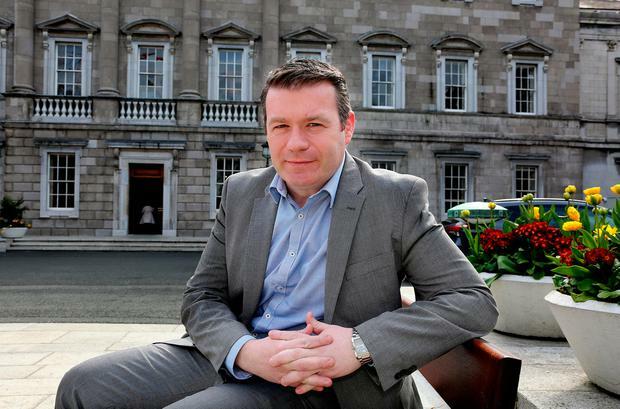 Alan Kelly has warned that the Labour Party is portraying an “absence of visible leadership” on economic issues affecting ordinary people. Writing exclusively in the Sunday Independent, Mr Kelly breaks his silence on the controversy surrounding Brendan Howlin‘s leadership by saying the party should be led by “strong personalities that represent political values”. Mr Howlin has come under intense pressure from councillors and party activists to step down since the start of the month. Sources close to the Tipperary TD said he has had nothing to do with the calls for Mr Howlin to resign and he has no intention of personally attacking the Labour leader. In today’s newspaper, Mr Kelly makes no reference to Mr Howlin but instead outlines in detail his vision for the party’s leadership. “Some people say that politics shouldn’t be about personalities. That’s nice in theory but simply wrong in practice,” he writes. “Leadership in politics has always been and forever will be about strong personalities that represent political values and generate support for them from the public. Yes that involves teamwork within a party but that party has to be led with passion, energy and conviction,” Mr Kelly adds. Mr Kelly says the party should reposition itself as the “voice of the working people” and ask themselves “what leadership of the Labour movement entails”. “Labour can no longer be part of a cosy consensus within Ireland. We must return to our roots with vigour and concern ourselves above all else with the problems of economic inequality. That must be our political crusade. Only then can we begin to regain the trust of those that the party exists to represent,” he says. Mr Kelly says the party needs to “regain the trust” of the public and reconnect with areas of the country where Labour traditionally had a strong support base such as Cork and Kerry, Kilkenny, Waterford and Wicklow. “We need to draw a line under the last government, admit our mistakes and let others judge our many achievements. Then by being true to our historic values and always targeting economic inequality, we can begin the task of reconnecting with communities and regaining that trust,” he says. “But it requires leadership. It requires people who will do what is right for the country long term rather than for themselves,” he adds. He also notes that Labour has polled lower than its 2014 local election result in 63 out of 64 opinion polls published since the last general election. Mr Howlin has faced an increasing number of calls from Labour Party councillors to step down as leader and allow a leadership contest. A group of 14 Labour councillors last week requested a meeting with Mr Howlin, which he dismissed. Yesterday, an officially recognised arm of the party, Labour Equality, said it no longer had confidence in Mr Howlin’s leadership. However, the Labour leader has so far dismissed attempts to force him to resign and 16 councillors issued a statement supporting his leadership earlier this month. Mr Howlin has invited all elected representatives to a party meeting in Drogheda next month where it is expected his leadership will be discussed.